A bit of history: name or water? Care and feeding, what to pay attention? Reproduction: as, when and how? The main element of the landscape, the blooming hydrangea with tight “caps”-buds. 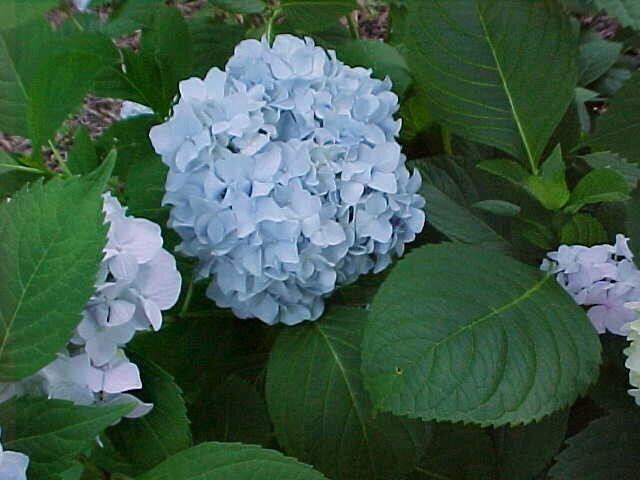 Island of several hydrangeas or even the lone Bush of this beautiful plant with spherical or pyramidal inflorescences adorn even the Royal garden. Garden beauty capricious in care, but it is worth it, to make an extra effort to grow this wonderful flower on your site. In Europe first appeared macrophylla cultivar, it happened in the late eighteenth century. Located in the Indian ocean island of Mauritius was visited by the French travellers, they brought a beautiful plant with a. Party world tour was Prince of the Roman Empire, Nassau-Siegen, legend has it, what he called the exotic flower, the name of his sister. Another historical legend says, that the name Bush was in honor of the beloved French doctor Commerson. There is and less romantic version of appearance the name of: only Bush was accidentally discovered in the garden of the Governor and it was called "hortensis", that means "from the garden". The moisture-loving hydrangeas, hence the second name – gerante, a literal translation of the Greek: "water" and "vessel". Themselves bolls is also similar to the small jars. The first name is much nicer to the ear and it is used much more often. Hydrangea near the house wall, example of landscape design. The family hortenziyevyh includes dozens of varieties. Most often it is large-leaved flowering shrub, but sometimes the so-called small trees, and even lianas. Inflorescence paniculate or dashboard, located at the ends of shoots. The edges are fruitless flowers, in the center of fertile, capable of reproduction. Some types of flowers produce fruit, forming a beautiful large balls. The petals of the plant can be white, blue, pink, red, blue and purple. The leaves are also attractive: large, bright, juicy. Against this background, the flowers look bright and attractive. Outdoors grown the following types: tree, paniculate, groundcover, radiant, garden, serrated, ash, petiolate, rough and large. 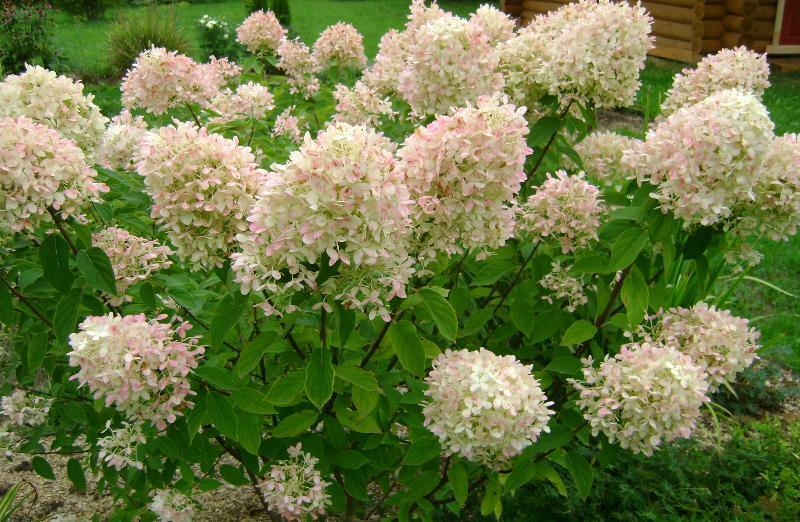 Paniculata hydrangea is similar to ice cream, which is embossed in a waffle Cup. Cone-panicle length 20 cm consists of small and large flowers. At the beginning of flowering, the white petals, then start turning pink, at the end of the season in the pink color added greenish hues. The change of coloration is a common symptom for a shrub of this species. Leaves elliptical, fuzzy, to the touch – velvety. 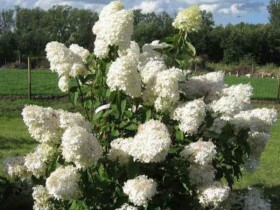 Paniculata hydrangeas bloom for a long time, early varieties bloom in June, the process is going on in July. "Grandiflora" or "PI guy". Grade long, popular, dense inflorescences are composed of sterile flowers. "Limelight" – tall shrub, able to grow up to five feet. Breeders bred and stunted subspecies "little lime", to 1 meters in height. Panicles of greenish, turn pink at the end of the season. 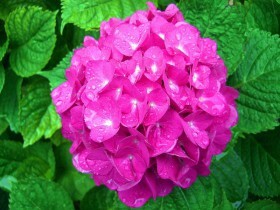 Variety of hydrangea with the funny name of "Pinky-Winky" reaches a height of 1,8 meter. Blossoms – delicate, large flowers at the end of the growing season are purple-pink. "Phantom" is almost a tree, its height is 2,5 meter. The crown is spreading, requires a lot of space on the plot. Panicles early in the flowering cream, in late summer turn pink. Vanilla and strawberry blossoms "vanilla FRAS" is also similar to ice cream, Bush high, to 2 meters. A reduced copy of the grade – "Sunday Frase". Red petals "Diamond Rouge" blaze on a green background. Plant height – up to 1,8 meter. A spectacular six-foot "great Old" differs from other varieties of the, its petals have the shape of a propeller, the large flowers are "floating" above the mass of small. The sort of "white Lady" is similar to Jasmine. White petals look like butterflies, who's going to fly. "VIMS Red" changes the color for the season three times: in June, the petals white, in July, pink, at the end of the season – Burgundy-red. Great variety for a well-tended garden. Hydrangea are beautiful and exquisite in all its manifestations: there are plenty to choose from and a lot of work. 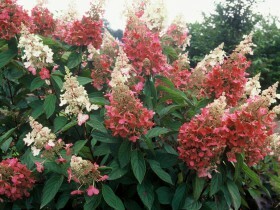 Varieties of tree hydrangeas can tolerate difficult climatic conditions. The plant may freeze in a very harsh winter, in other cases, successfully survive till spring. In fact it is still a shrub, growing to a height of 1,5 meter. Large leaves are egg-shaped and serrated at the edges, on top they are green, bottom – SIZ. Inflorescence "Hayes Starburst." diameter 25 cm consist of large plush colors, at the beginning of flowering they are greenish, in the end – bright white. Thin branches of a Bush can break off, not withstanding the gravity. White flowering balls "Incrediball" affect not just big, and giant sizes. The plant itself reaches a height of five feet. "Invincibelle Spirit" in early summer, has a bright pink shade, exposition, acquiring by the fall of a noble pallor. Large flowers "white House" creamy white color fringe plate of fertile flowers. The Bush is medium height: 1 – 1,4 meter. 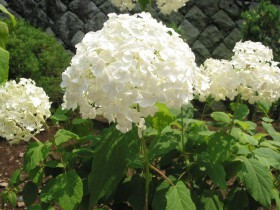 The loose inflorescence of this variety of hydrangea are shaped flap: large flowers are located at the edges, small – mid. Shrub include "crawling means": through rhizomes and suckers, he are able to climb the wall built to a height of 25 meters. The greenery hides the brickwork, the plant looks very picturesque. Unfortunately, Russian winter this hydrangea is not going through, but it can be used as a groundcover. 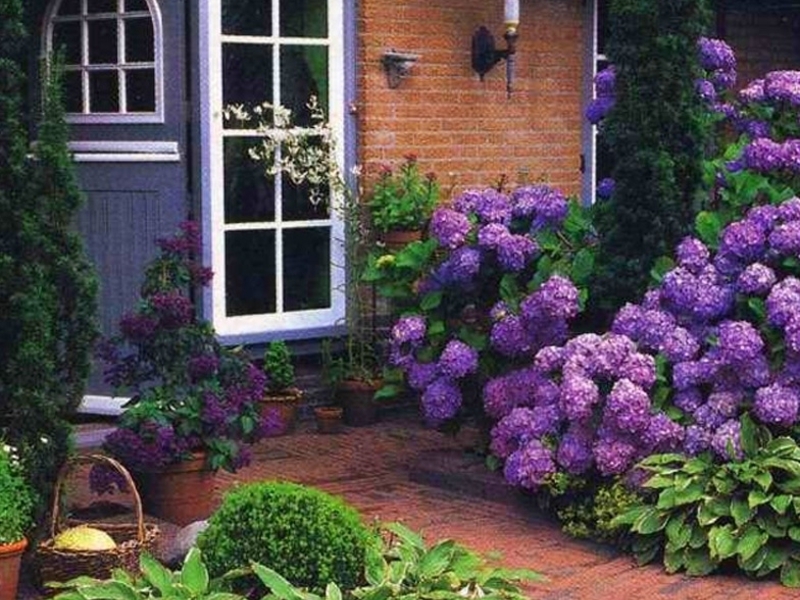 In the Baltic States stemmed hydrangea able to spend the winter on poles. The species is widely distributed and delights gardeners a variety of colors. Various form inflorescences. In winter the hydrangeas need to cover, there is no guarantee, she will survive the winter or not sopreyut. The best way is to breed her in a greenhouse, then planted in the open ground, in the autumn capricious beauty again to move to the greenhouse. But the winter she would have to spend in the basement. Bush is not high, all the movements were not reflected on the plant, it can be grown in a tub. Planting hydrangeas in the ground. 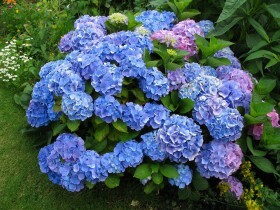 The best time for planting hydrangeas is in the autumn or spring, in a pinch, we can do this in the summer. Pick up place so you need, to the hottest, afternoon, the hive was in the shade or in partial shade. Drought and scorching heat plant tolerates extremely bad. The soil must be acidic, to create a special regime and composition of the soil in the planting hole put a special blend for azaleas or peat. A good option is to mix compost, peat, leaf humus, all components are taken in equal proportions. Compost can be replaced with superphosphate or potassium sulphate. The planting hole should reach 50 cm in depth and 60 cm wide. Soil – loose, that tree had the ability to freely "breathe". Before planting, the roots of plants need to be shortened, shoots to cut to a third or fourth kidney. Seedling, after placing in the ground, should be watered, sprinkle peat mulch. As mulch suitable sawdust and film, burlap and paper, needles and compost, expanded clay and straw. This procedure will help to maintain the correct air mode. 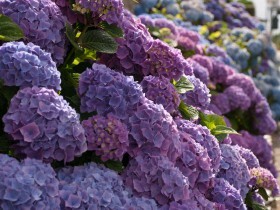 If the hydrangea will perform the role of "hedges", the bushes should be placed at a distance of two to three meters from each other. More frequent planting can lead to "conflicts" – the plants just strangle each other. The plant will delight in the summer season, if you take care of it. The soil should be periodically loosened to a depth 5 – 7 cm, as necessary to pour new mulch. Watering is only warm and the water pooled, near root soil should not dry out. Fertilizing is done twice a month, the use of mineral or organic fertilizer. If the plants are tall it is better to install support, to avoid breaking branches. Rejuvenate old shrubs, at the end of October make cutting the weak shoots, others are pruned to one or two pairs of buds. In the spring pruning repeat, removing the frozen winter branches. The upper part of the shoots last year the cut is not necessary, the plant will die. Beauty is never too much, sooner or later it will be necessary to propagate the plant, to plant new shrubs or replace the old, dead. Hydrangea seeds harvested in the fall. In open ground they can be sown in late April or in may. If all the rules of planting and care are met, the plant does not suffer, the first flowering of a Bush to wait two years. 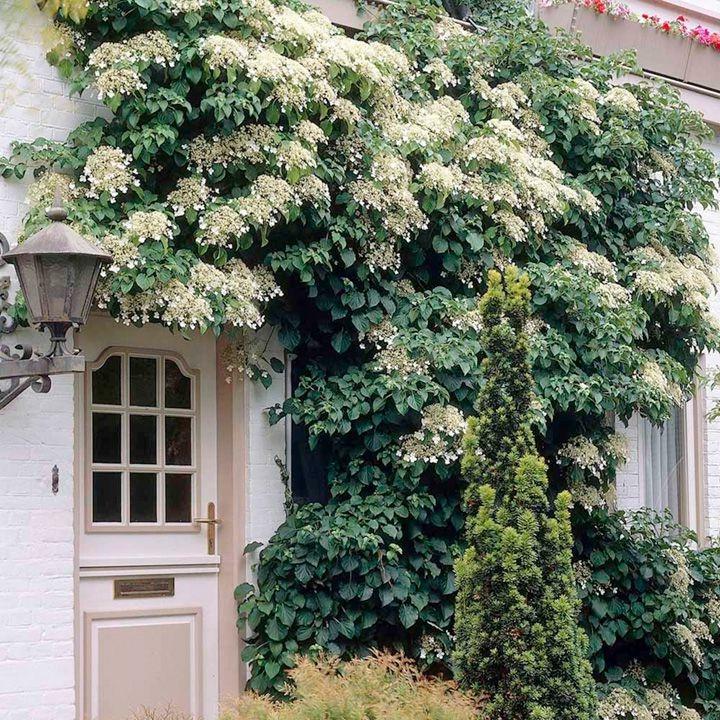 Large shrub can be divided into several parts, this is best done in the spring. For grafting you will need planting material is the current year, he rooted through 20 – 25 days. With the vagaries of hydrangea you need to fight. If you follow all farming techniques, to learn from knowledgeable gardeners, the long garden will delight you with its fabulous views. The beauty of going on with his hands, apply certain efforts and they will pay off handsomely. 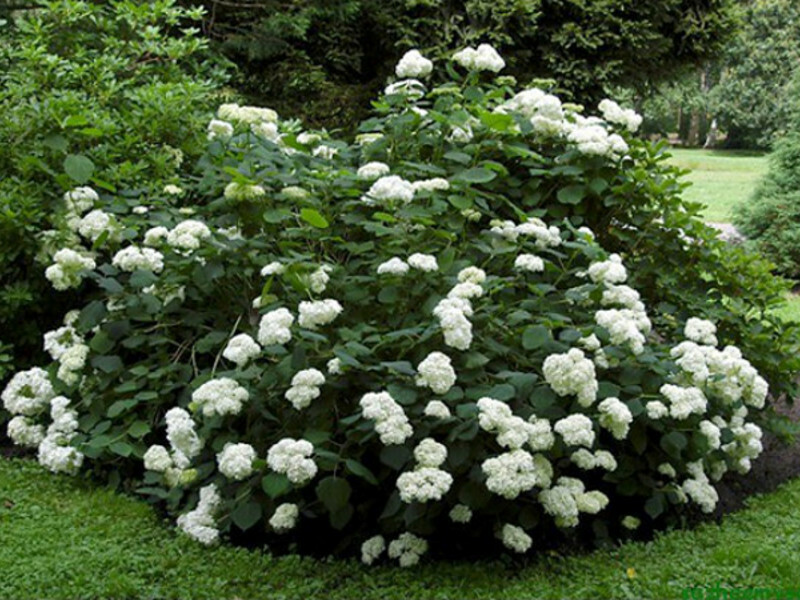 “Grandiflora” is a popular cultivar of paniculata hydrangeas. Deep pink flowers – a bright spot on a dark green background. Blue hydrangea – sweet and romantic. Japanese white balls of hydrangeas. All content on this site SamDizajner.ru written specifically for Simdesigner, copying 1 in 1 strictly prohibited. 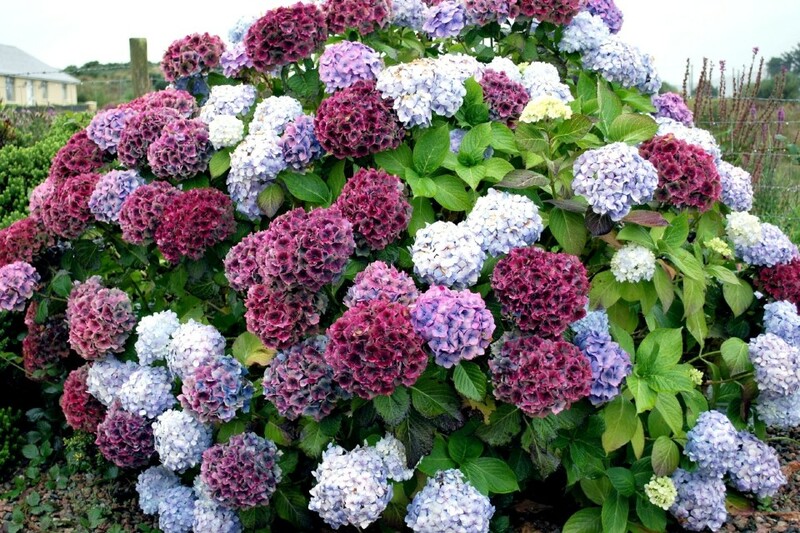 Reprint, full or partial rewriting of the article “Beautiful hydrangea – whimsical garden beauty”, possible, only when you specify the full, active link to the source.